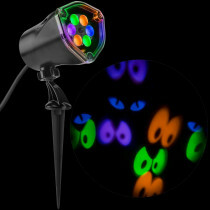 Create a spooky Halloween light show of floating, whirling eyes with this LED projection light. Just stake it into the ground. Once plugged in and pointed it at your wall, garage door, fence, or any other flat surface, just watch the show begin.